I've recently fallen back in love with my crockpot. We took a break. AKA homegirl got lazy and stopped cooking. But we met again on a nice Sunday afternoon and we made a delicious recipe. Nothing warms my heart more than Indian food. I just love it. All the time. And I can easily make it at home. Most recipes do call for chicken thighs, but my grocery store had boneless skinless chicken breasts on sale so I bought those instead. If your store has chicken thighs on sale or you're feeling like splurging, feel free to substitute them, but what I used tasted just fine to me. Cut up your chicken into 1- to 2-inch cubes and place them in a large bowl. Add in your tumeric, cumin, salt and greek yogurt, and toss until all of your chicken is coated. Let it sit for about 10 minutes. Heat one tablespoon of butter in a skillet over medium-high heat. Add in about a quarter of your chicken and brown it, and then place the chicken into your slow cooker. Repeat with three more batches of chicken. In the same pan, melt your next four tablespoons of butter, then add in your onions, garlic and salt and sautee until fragrant. Add in your garam masala and ginger and cook it all together for about a minute. Crank your heat up to high and pop in your crushed tomatoes and your sugar. Bring it to a boil, and then add the sauce to your slow cooker. Set it to high for about two hours, then turn it down low for two more hours (or just turn it on low for about five or six hours). Go about your business. Clean. Watch a movie. At the very end, mix together your heavy cream and corn starch and whisk it all up until there are no lumps. Add it into your slow cooker and stir it all in until you get a consistent color. Let that ish cook for another 10 minutes or so. In the meantime, cook up some basmati rice. Plate some rice and top it with the chicken tikka and BAM. Dinner. I saw your instagram and was like god I hope she shares this recipe. 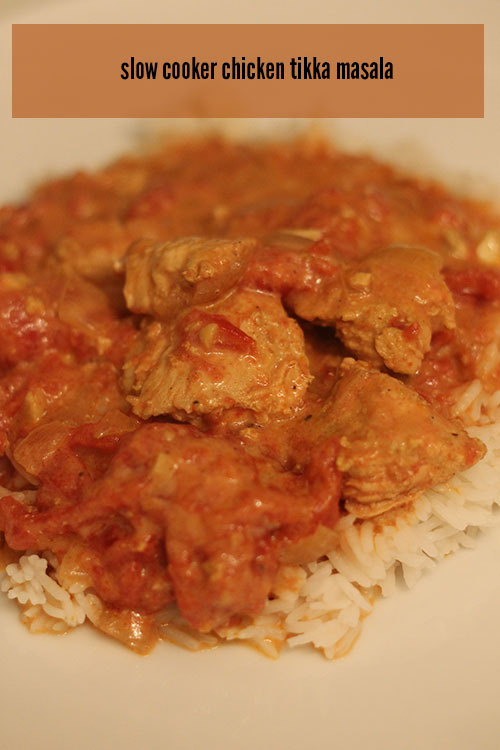 I cannot resist tikka masala anything, and this sounds too easy and delish. It's seriously the easiest. You must try. I didnt even know you could make that in the slow cooker! mind blown. It makes the chicken just like how it is at the restaurants!